Infilex VN is a venturi valve combined with an airflow controller, designed to control airflow rate/room pressure in research facilities, fabrication facilities, and hospitals. Infilex VN directly communicates with our building management system (BMS) savic-net™FX via LonTalk® protocol. This enables you to supervise airflow volume and status of fume hood exhaust, general exhaust, and supply air from savic-net FX center unit (client PC). The valve performs self-balancing operation to maintain a fixed flow of air by adjusting to changes in duct static pressure. 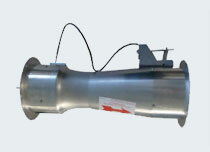 High-speed electric actuator mounted onto the valve quickly responds to the changes in airflow command. Zone Presence Sensor Model ZPS2XX detects the presence of personnel in front of the fume hood. 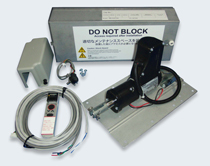 Zone Presence Sensor sends signal of standard mode (standard flow, 0.5 m/s face velocity for example) to the venturi airflow control valve Infilex VN. Zone Presence Sensor sends signal of standby mode (lower flow, 0.3 m/s face velocity for example) to the venturi airflow control valve Infilex VN in order to save energy. Fume Hood Monitor Model QVN is a digital indicator with emergency exhaust override button for the Infilex VN venturi valve. Calculated*1 or preset face velocity is displayed on the backlit LCD (available only for VAV control model). Fume hood operating and alarming conditions are indicated. A user is informed of alarm by audible alarm and LCD indication. Emergency exhaust override is initiated by the emergency exhaust button (available only for VAV control model). Operating conditions in energy saving are displayed. *1 Face velocity is calculated based on feedback airflow volume and fume hood sash position (opening). Sash Sensor Model VSS1X0/HSSX0X/CSSXXX detects a fume hood’s sash position and figures out opening area. This Sash Sensor is used with the venturi valve Infilex VN to maintain a constant average face velocity at the fume hood sash opening. Venturi valve for constant air volume is designed to provide high accuracy and quick response for airflow control especially in a laboratory, containment room, clean room, animal holding facility, and hospital, requiring highly accurate supply/exhaust airflow control. This valve has self-control structure that maintains a fixed flow of air by adjusting to changes in duct static pressure (pressure-independent mechanism). 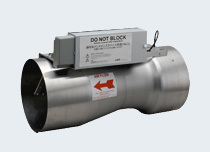 The compact cage rack valve (CVR) Model CVR120X combines field tunable flow rate with a pressure-independent flow regulator to meet the unique requirements of ventilated cage rack connections to building ventilation systems. The flow control assembly is precisely characterized at factory to keep the constant flow volume designated by the airflow setpoint. Worm gear mechanism allows field-tuning of airflow to change airflow in the cage rack when necessary. The cage rack valve automatically compensates for system static pressure fluctuations to maintain the airflow setpoint. It is a kit to upgrade the already installed "critical environment system" to a system equivalent to Infilex VN, an "airflow control system". The set of electrical components can be replaced at a low price. 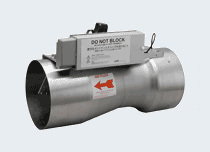 The kit minimizes the time required for upgrade, with no need for valve removal from the duct. The actuator is electrically driven. 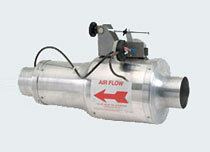 An air source device and its maintenance are not required if a "pneumatic" valve has been installed. It can be integrated with our Central Management System*2. *2 Central Management System has to be savic-net FX System and System Core Server for Infilex VN (V-SCS) has to be connected. Since the model with room pressure adjustment control can measure the room differential pressure, and has the feedback control to maintain the room pressure constant and various adjustment logics, it enables more precise room pressure control. (Differential pressure sensor is required separately. )*3 Infilex VN directly communicates with our building management system (BMS) savic-net FX via LonTalk® protocol. This enables you to supervise airflow volume and status of fume hood exhaust, general exhaust, and supply air from savic-net FX center unit (client PC). High speed of response: 1 second or less. Airflow control not affected by duct static pressure fluctuation*4. Airflow control not affected by ductwork*4. No additional straight duct runs needed*4. Installable in horizontal/vertical duct runs (depending on the models). Characterized (calibrated) at factory and no field adjustment required. The room pressure monitor*5 can be connected for the room pressure adjustment control model. *3 In order to measure the room differential pressure, a differential pressure sensor is required separately. A model number for the differential pressure sensor is also available. Valve specifications and Performance Curves of Pressure-Independent Control. 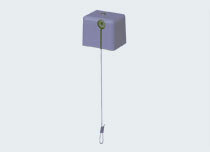 *5 For more details, refer to AS-943E Room Pressure Monitor for Infilex VN Venturi Valve Specifications. 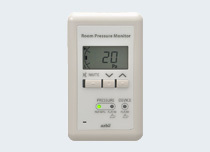 The room pressure monitor is a displaying and setting device for venturi valve (normal speed) Infilex VN, which is equipped with a controller for airflow/room pressure control. The monitor displays the room pressure measured by the system. Also, if a room pressure error or valve operation problem occurs, it notifies users. The monitor displays the room pressure measured by the system. If room pressure is abnormal, it notifies users by a buzzer and LED/LCD indication. Pa (pascals) or inWC (inch water column) can be selected as the unit of indoor air pressure measurement. The room pressure setpoint can be changed by the monitor. By setting the parameters for the valve, the ability to change the room pressure setpoint can be enabled or disabled. Switches the room pressure setpoint in order to change the use of the room or to change the setpoint quickly in an emergency. The room pressure monitor can have two setpoints. 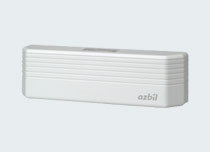 By switching between them, the setpoint for the room can be switched smoothly. By setting the parameters for the valve, the ability to switch between room pressure setpoints can be enabled or disabled. When there is a problem with the airflow control valve in the room, the user is notified by the DEVICE alarm LED on the room pressure monitor and by a buzzer. By using the keys in a specified way, the functions of the LED, LCD, buzzer, and key can be checked. By inspecting these functions regularly, the monitor can be maintained in a ready state for alarm notification or emergency operation. As required for the application, up to two room pressure monitors can be installed (for example, one unit in a room and one in a hallway, or two units in a room). *6 The user cannot change the enabled/disabled setting. savic-net FX Research Environment Management Server is a management support server to understand the operational condition of the laboratory and promote energy-saving measures and safety control. It provides the lab with an effective operation through mutual participation of researchers who use the lab, and Environmental Safety Manager and Building Manager who are engaged in operational management of the lab. It provides information for energy conservation, safety control, and the appropriate facility planning, using data a venturi valve with airflow controller (Infilex VN) holds. It monitors the status of use and the exhaust airflow of a local exhaust ventilation device such as fume hood, supporting its energy efficient operation by quantifying energy loss for each lab or each fume hood. It optimizes operation and helps reduce the energy consumption of the facility with an effective use of the venturi valve with airflow controller (Infilex VN). Monitoring of the maximum exhaust airflow enables you to obtain the extra capacity (safety margin) of the exhaust ventilation system. Also, the optimized operation can make the safety margin bigger, i.e. the difference between the actual airflow and the ideal airflow. An effective use of the venturi valve with airflow controller (Infilex VN) quantifies the safety margin and enhances the safety capability of the facility. It supports safety control by researchers through mutual monitoring combined with historical management of the equipment error alarm. Those who are engaged in operational management of the lab, such as researchers, Environmental Safety Managers, or Building Managers can share all the information via intranet. 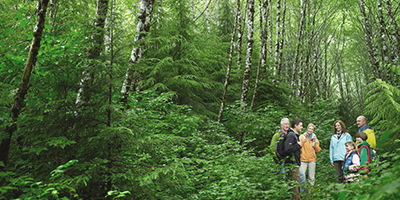 You can mutually understand how safe or energy efficient your lab is by accessing the research environment management server from your PC via intranet. Information sharing among those who are engaged in operational management of the lab, such as researchers, Environmental Safety Managers, or Building Managers allows you to analyze the status of use and the exhaust airflow of the fume hood and to prepare a facility plan based on the actual data. The server provides you with airflow data required to understand the impact of addition or relocation of a fume hood to the related exhaust ventilation equipment, achieving facility planning in line with the actual operational conditions of your facility.